The first of our Halloween screenings is going to be the The Cabinet of Dr Caligari/Das Kabinet des Dr Caligari with live Wurlitzer cinema organ accompaniment. It will screen on Sunday 16 October at Pollokshaws Burgh Hall. The film will start at 8pm, doors at 7pm. Tickets are £5 (£6 on the door) and are available in advance, on the night and also online from Tickets Scotland (search by date or for Southside Film, with £1 booking fee). Advance film tickets are available from Young’s Interesting Books, Skirving St, Shawlands and at iBop on Fri 4 October at Pollok ExServicemens Club, Titwood Rd, Crossmyloof. Considered by many to be the best horror film of the silent era, The Cabinet of Dr Caligari/ Das Kabinet des Dr Caligari is a classic example of German expressionism and is still impressive today. The film was shocking and original when released, partly due to its twist ending, but also because of its warped and confused world and its twisted and crooked sets. Synopsis: At a fair, Alan and his fiancée Jane meet Dr. Caligari and his somnambulist, Cesare, who can predict the future. Cesare reveals to Alan that he only has until dawn to live. This prediction proves true when Alan is murdered. Cesare becomes the prime suspect and then abducts Jane before dying himself. 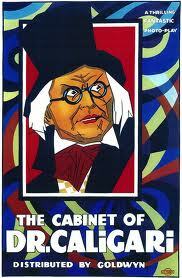 Dr. Caligari retreats to a mental asylum, where his truth is revealed. Don’t miss this screening in the beautiful surroundings of Pollokshaws Burgh Hall! with Wurtlizer organ accompaniment by organist David Gray, Royal Academy of Music student & Young Organist of the Year. Licensed bar and ice cream available.